A new analysis by Dutch researchers from Utrecht University has concluded that use of existing biotechnology in the production of so-called bulk chemicals could reduce consumption of non-renewable energy (nuclear, oil, gas, coal) and carbon emissions by a full 100 percent and more when biomass is used as a raw material. Most importantly, in the future green chemicals made in biorefineries could contribute in a very significant way to combating climate change, by saving up to 1 billion tonnes of CO2 emissions worldwide. To give an idea, this is equivalent to taking all European cars and trucks off the road. What is more, the scientists found that in some cases it would be more efficient to use land to grow feedstocks for green chemicals instead of liquid biofuels. The study appeared as an open access article in Environmental Science & Technology. Bulk chemicals like ethylene, butanol or acrylic acid are the basic raw materials used in the production of everything from plastics and fertilizers to electronic components and medicines. Currently derived from crude oil and natural gas, bulk chemical production creates billions of tons of carbon dioxide each year. Still, the application of industrial biotechnology for the production of bulk chemicals has received much less attention than alternative fuel or biomass-derived energy production. B. G. Hermann and colleagues analyzed current and future technology routes leading to 15 bulk chemicals using industrial biotechnology, calculating their carbon emissions and fossil energy use. The life cycle inventory shows that with biotechnology advances in the future, worldwide CO2 savings in the range of 500-1000 million tons per year are possible. Even today, bio-based bulk chemicals "offer clear savings in non-renewable energy use and green house gas emissions with current technology compared to conventional petrochemical production", they write. The scientists present a prospective environmental assessment dealing with future processing routes, using proxies for the overall environmental impact of the bio-based products: non-renewable energy use (NREU), greenhouse gas emissions (GHG), and land use. NREU represents a straightforward and practical approach because many environmental impacts are related to energy use. NREU encompasses fossil and nuclear energy and was expressed as higher heating value (HHV), also called the gross calorific value. In line with LCA methodology, the NREU values reported here represent the cumulative energy demand for the system cradle-to-grave. Greenhouse gas emissions are of growing importance because of the increasing attention paid to the greenhouse effect in the policy arena, by companies, and by the public. GHG emissions were calculated in CO2 equivalents and consist of GHG emissions from the system in the form of CO2 or CH4, as well as nitrous oxide (N2O) from fertilizer use in biomass production. CO2 emissions from renewable carbon extracted from the atmosphere during plant growth were excluded. Land use refers to agricultural land use only and will be of increasing importance in the future because of the growth of land requirements for bio-based energy, liquid biofuels, bio-based chemicals, and food and feed production. We neglected the land requirements for industrial plants, for transportation infrastructure, and for waste management because they are small compared with agricultural land use and are comparable for bio-based and petrochemical products. Three different carbohydrate raw material sources for the products were analysed, both as they are produced currently, and how they are expected to be produced in the future: sucrose from sugar cane, glucose from corn starch, and fermentable sugars from lignocellulosic biomass (wood, grasses, etc...). They found that for most products, the energy and emissions savings are highest when the feedstock is sugar from cane (both today and in the future), even higher than sugar from lignocellulosic biomass. (In this sense, there is once again a case to be made for a 'Biopact' on green chemicals - see our previous overview of the state of research into biopolymers and bioplastics in the Global South, and previous articles on sugarcane bioproducts here, here, and here). Almost all products promise GHG savings for current technology. For PHA and adipic acid, this depends on the source of fermentable sugar. Acetic acid offers no savings using current technology because of low broth concentration and low productivity in fermentation, as well as high utility use in downstream processing because of the difficulty of separating acetic acid from water (azeotropic mixture). GHG savings for PTT are low because this polymer is made from PDO and purified terephthalic acid, with the latter being produced from petrochemical feedstocks. GHG savings for sugar cane as the source of fermentable sugar are clearly higher than for cornstarch because of the coproduction of significant amounts of electricity which can be exported. 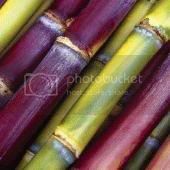 To maximize greenhouse gas savings for green chemicals sugar cane is favored over lignocellulosics, which in turn is preferable to corn starch as source of fermentable sugar. In temperate climates such as Europe and North America, where sugar cane is not available from domestic production, lignocellulosics should be the preferred future feedstock. Interestingly, in some of the lignocellulosics and sugar cane cases, the savings are larger than 100% because the energy credits from co-combustion of waste biomass or from side-streams of agricultural production were larger than the GHG emissions for the industrial biotechnology process chain. In a sense, these green products would not merely be 'carbon neutral', but yield 'negative emissions'. On average, GHG savings for future industrial biotechnology pathways are 25-35% higher than for current technologies. This shows that technological progress can further enhance the environmental advantage of green chemicals over their petrochemical equivalents. Low GHG emissions of a process may be caused by (1) high product yield from fermentation or (2) low product yield from fermentation combined with large energy credits from subsequent combustion of coproduced biomass. In the second case, the inefficient fermentation processes require considerably more land for biomass production than efficient fermentation does. If land availability becomes limited, GHG savings should be maximized for a given amount of land, or alternatively, land use should be minimized for a certain amount of GHG to be saved. Graph 2 (click to enlarge) therefore simultaneously analyzes GHG savings in all green chemical production-routes relative to the petrochemical route and land use per ton of chemical. It shows that there is a relationship between the type of chemical and the amount of land use for its production from sugar cane. For the production of one ton carboxylic acids 0.1-0.2 ha land are required, whereas the alcohols are in the range of 0.25-0.35 ha/t. For PTT, land use and GHG savings are low because only a part of this polymer is produced from bio-based feedstocks. Putting GHG savings and low land-use first, succinic acid, caprolactam, PLA, and butanol are the most attractive. Producing fuel ethanol from sugar cane results in savings of 10-16 t CO2,eq/ha. But several green chemicals show CO2 savings above 16 t CO2,eq/ha and are therefore preferable from the point of view of CO2 mitigation. An analysis of future technologies shows that land-use efficiency in terms of CO2 savings per hectare is much better for corn stover than for sugar cane (graph 3, click to enlarge). Conversion of corn stover to chemicals using future technology almost always results in CO2 savings above 25 t/ha. Biomass for electricity use saves approximately 12 t CO2,eq/ha for whole crop wheat and using lignocellulosics for fuel ethanol production saves 2-7 t CO2,eq/ha (however, note that the researchers did not take into account the coupling of bio-electricity production coupled to carbon capture and storage, which would save much more CO2 by burying it under ground). Putting CO2 savings first, this implies that most chemicals are preferred over bioenergy if sugar cane is used as feedstock, and almost all chemicals are preferred if using corn stover. A quantification of the total GHG savings potentials for green chemicals, assuming full substitution of the petrochemical equivalents and based on world production capacities in the years 1999/2000 are shown in table 1 (click to enlarge). The total saving potential for the future according to (510 million tons CO2,eq for corn starch) disregards growth of the chemical industry. The future saving potential is even higher if lignocellulosics (820 million tons CO2,eq) or sugar cane (1030 million tons CO2,eq) are used as feedstocks. For comparison, current technology production of the petrochemical equivalents lead to emissions of 880 million tons CO2,eq for the same installed capacity and system boundaries. This shows that the potential GHG savings for current technology and corn starch as feedstock already reach 45%. In summary, even at present, bio-based bulk chemicals from industrial biotechnology offer clear savings in non-renewable energy use and GHG emissions with current technology compared to conventional petrochemical production. Substantial further savings are possible for the future by improved fermentation and downstream processing. Of all feedstocks, sugar cane is to be favored over lignocellulosics, which in turn is preferable to corn starch as source of fermentable sugar to maximize savings. The products with the highest savings are acrylic acid, butanol (from ABE process), ethanol, ethylene, PDO, and PHA. This builds a strong case for the production of bio-based bulk chemicals using industrial biotechnology considering the economic and environmental advantages of 1,3-propanediol, polytrimethylene terephthalate, succinic acid, and ethanol for current technologies and of all products except acetic acid for future technology. Eurekalert: Existing biotechnology could save energy and cut CO2 by 100 percent - December 17, 2007.